Full back James Justin was overjoyed to see Luton’s squad stay put during the January transfer window which shut recently. The Hatters managed to add a trio of new faces on deadline day in Jason Cummings, Alex Baptiste and Aaron Connolly, with George Thorne and George Moncur already on board. It was very important to keep everyone together, to keep the form we’re in, to keep it going. However, no first team players went the other way, meaning Town kept the squad, who have got them to the top of the table, together. Justin, who made his 100th appearance for the club against Wycombe on Saturday, said: “I saw Gary Sweet say ‘if Carlsberg did January transfer windows’ and that’s exactly what it is. “We’ve added quality, everyone who’s come in and everyone’s pushing for that first team place. “It might be a bit before they get in, but when they get in, they’ll be ready. “It was very important to keep everyone together, to keep the form we’re in, to keep it going. Justin was one of the main players who speculation has followed over recent windows, but is wise enough not to let it bother him nowadays. The full back is now back in the side more, starting the last 18 league games, and has quite simply flourished since his recall, taking his performances to a new level. He admitted it had been tough on the sidelines, but quite rightly feels he has taken his opportunity now. “But I knew it wasn’t possible as we were doing so well last year and it’s hard to break up a winning side. “I’m quite a level-headed person, obviously it was frustrating not being in the side, but I just knew I had to keep getting better. 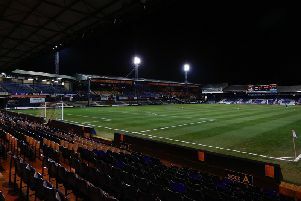 Town now have a fantastic chance of not just winning a second successive promotion this term, but going up to the Championship as League One title-winners. On their aims, Justin added: “We’ve set ourselves no ceiling there. “So hopefully we can just continue getting points on the board and then see where we are at the end of the season.